As the capture season continues so does the immense uprising of dissent against the capture of your beautiful wild horses. The overwhelming support that the wild horses have found, grows each and every day. 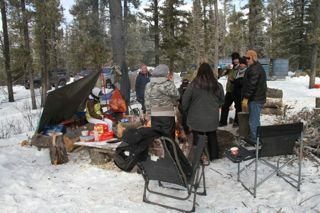 At the entrance to the Williams Creek Road that leads to one of the trapping site a large entourage of supporters have set up camp. There even is one young lady who has remained out there monitoring the horses being removed 24 hours a day even in the frigid temperatures. This shows the amazing dedication of people to work toward saving your wild horses. Every day she is joined by other supporters who also show their support. 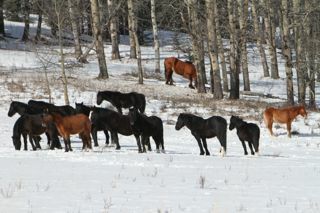 I don’t think words can ever express my gratitude for all of these people who support the wild horses and continue to let their feelings and well wishes be expressed on the “Help Alberta Wildies” Facebook page. Also the emails and comments I get here are very uplifting as our fight continues. The trapping season is supposed to end on February 28, 2014 as per the regulation, however the ESRD continues to play games with the lives of your wild horses. The talk was going around about them extending the capture season to allow the “quotas” to be met. When the question was put to the two ESRD staff in charge of the permit process, about the extension, both stated “no decision has been made.” This was the same statement they made 2 days prior to announcing the cull in January. Again they show that they are not willing to be up front and honest with the citizens of Alberta. Can we really trust them? This picture shows a typical small herd where, at this time of year, two of mares are heavy in foal and approaching term. An extension of the capture season to reach the supposed quota could mean that mares similar to these would be caught up in the pens. This act in itself would be extremely inhumane, let alone the distress that they would undergo following the capture and transportation to the meat buyers. The ESRD continues to say that the capture methods are humane (really??). One would guess they have no understanding or do they really care about the overall welfare of these beautiful animals. A contraception program is being developed by Dr. Judith Samson-French and the WHOAS Board of Directors has thrown their full support behind her efforts. We will provide financial aide to get this program off the ground. Therefore the government will have no excuse to state that this is too expensive to undertake. Also despite their claims of contraception of mares being new and unproven, it has been successfully used for many years in the United States in other wild horse herds. This is a positive solution to manage the wild horse population and there would be no need to capture and send them to slaughter. 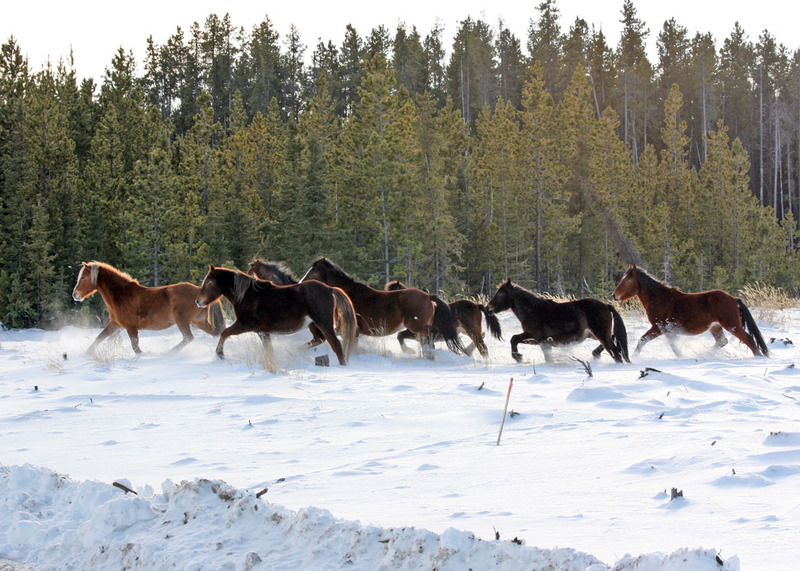 Winter continues to cause extreme hardships on the wild horses. 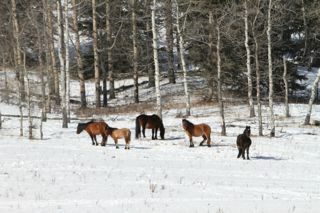 If you look closely at the mare at the back in the trees you can see the toll that winter has taken on her. There are many more like her including young ones out there. They need to be allowed just to survive without having to undergo an extended capture season dictated by the whims of the uncaring government bureaucrats. It is so important, and we can’t emphasis enough, that you continue to contact the minister of the ESRD. Please let them know how you feel toward the capture season of your Alberta wild horses and to please listen to “the voice” of Albertans. I just seen on the news that 5 people have been arrested and charged with mischief for documenting the capture west of Sundre. They were not interfering with the capture or tampering with the capture pens. The government should see first hand what happens with the capture instead of having concerned citizens arrested just because they are documenting what is going on. What bunch of BS that is. Maybe the SPCA should have some of the capture cowboys arrested for inhumane treatment of animals. Thank for hellping this beautiful animals ,just wonder do you have any petition so we can sign ? Hi, i’m a grade 7 student in Grand Prairie area and me and my friend have and love horses and would like to start a petition to save them before they are all gone! We will research all we can and find as many people as posible. I would like to keep in touch with you so we can get status updates on whats going on with the horses as well as were to send the petition (if its to you or someone else) E-mail me please ASAP so i can start my petition. So so sad these majestic animals are being “murdered”. Still do not know how the provincial government is allowed to make this decision. We are loosing our heritage. Thank you for all you do. Let the horses live in peace. Please take care of these wonderful animals!! Please take care of these wonderful animals. thank you! Just as in the US, the government claims there are hundreds of horses doing extensive damage. It is a numbers game. Report that there are 800 horses (when there are really only 15) allow 200 to be captured, and round up 15 (saying the others must be hiding). In the US it’s called “zeroing out” an area. Now there are NONE in many areas where a few bands used to roam free. The damage will continue after the horses are gone, because it’s cows and their dead poop pies that degrade the land. Search: A Biologist’s Response to the BLM’s Wild Horse “Problem” – Biologist, Robert C. Bauer lays out the whole deception.